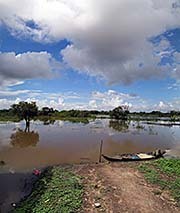 Southeast Asia's great lake, the Tonle Sap, is located in northwest Cambodia. It is a large and unique ecosystem and provided in the past, with it's richdom of fish and annual floods, the basis for the grand medieval empire of Angkor. The huge Tonle Sap Lake is part of the Greater Mekong Subregion. The lake is connected with the Mekong River by the Tonle Sap River. However, this river shows a world-unique behaviour over the year. 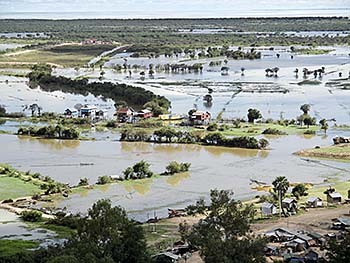 While it is draining in the months between November to May, the lake's water downstream into the Mekong, the Tonle Sap River is reversing it's stream direction in the rainy season between June to October. Cambodia is a widely flat country, minted by large plains. 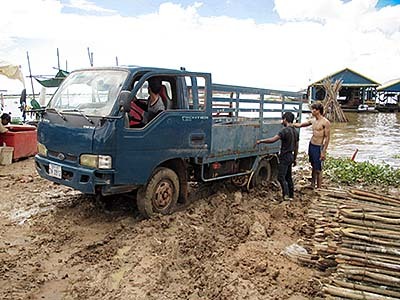 When in rainy season the Mekong River swells on up to four times the water volume as it carries in the dry season, the water level rises so high that it is then draining water through the Tonle Sap River upwards into the great lake. The Mekong River and the Tonle Sap River join in Phnom Penh and split just a few meters downstream up again into Mekong and Bassac, marking the beginning of the Mekong Delta. The Tonle Sap River stretches over a lenght of 120km. While the great lake, the largest lake in Southeast Asia, covers in the dry season between 2,600km2 and 3,000km2, it's expanding in rainy season up to 10,400km2. The lake's length varies between 160km and 250km. If the surrounding river landscapes are getting included, the size is even up to 25,000km2. The lake's depth rises from 2m to 3m up to 14m. The peak of the water level is usually reached at the end of September to October. There are some traffic routes crossing the great lake. There is a ferry connection between Siem Reap and Phnom Penh, from where it's possible to continue travelling on the Mekong River into Laos or Vietnam. Another ferry connects once daily Siem Reap with Battambang and leads partially the Sangkae River upwards. Natives use the waterways since thousands of years to travel the lake's tributaries up and down. However, since in the very last years the roadnet is getting improved, more and more traffic is running on the streets now. The local economy is, as it is not otherwise to expect, minted by fishing and agriculture. An irrigation system grants the farmers water supplies from surrounding rivers and the lake. The Cambodian government has, in best neoliberal manner, privatized the most productive fisheries by giving leases to big companies owned by influencial people. These long-term leases last more than 100 years. 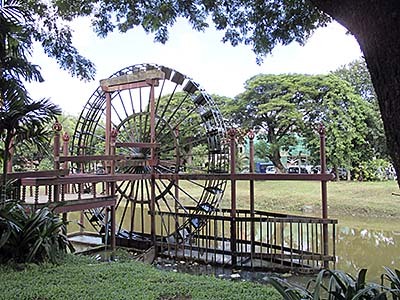 Traditional water management included water wheels. The stream turned the wheel which lifted water and poured it into a pipe, creating running water for the use of the neighbourhood. Can also be used for other purposes. In medieval times the Khmers of the time built a marvellous canal and irrigation system (see also: Angkor as a Hydraulic City). They managed to get up to four rice harvests per year. That surplus of food, together with plenty of fish, allowed the Khmers to feed the great workforce for the construction of the grand temples and to lead warfare against all their neighbours and rise a slave empire which lasted over more than 600 years. Nowadays the most of the fishermen living around the lake are Vietnamese or Cham. 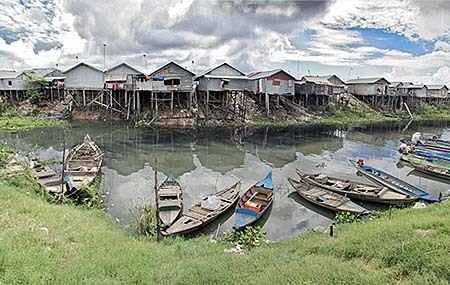 Regionally famous are the 'floating villages', wooden stilt houses, who are built on the water. Some of the houses are completely swimming like boats and can therefore (e.g. seasonally) be moved to other locations. Alltogether are approximately 1,2 million people living directly from and around the lake. At the end of the rainy season the abandunce of fish in the lake is highest. 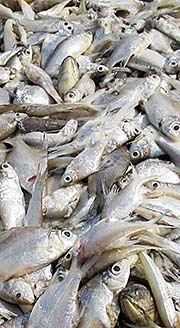 It's estimated that about 230,000 tons of fish are caught annually in Tonle Sap Lake. That's half of the fish which is caught in total in whole Cambodia, including the coast of the Gulf of Thailand. 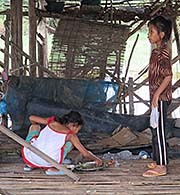 About 80% of the proteins consumed in Cambodia are coming from fish. By the way: the name of the Cambodian currency, the riel, is comming from a small silver carp and is emphasizing the importance of fish for the Cambodian diet. The Greater Mekong Subregion is the second richest in biodiversity on earth, only second behind the catchment area of the Amazon River in South America. In Tonle Sap Lake live about 300 fish species, and many birds, lizards, snakes, reptiles, mammals, insects live in or around the lake. Even pelicans are living here (the spot-billed pelican). Tonle Sap Lake was also home for the Giant Mekong Catfish, but it's doubtful if some still survived here. At a closer look a number of different habitats appear in this biosphere who are connected to each other. 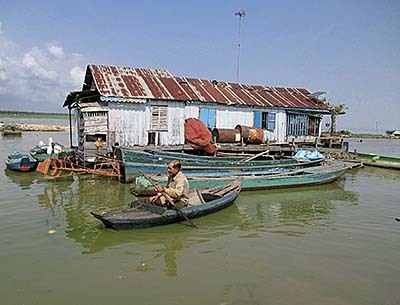 Tonle Sap has been declared an ecological hotspot by the UN Educational, Scientific and Cultural Organization. Since 2001 it's also a Biosphere Reserve. However, that means nothing in anomic Cambodia; the environmental destruction of the ecosystem is going on with increasing speed. The amount of fish caught annually is steadily declining. The lake is bordered by low hills, of whom Phnom Krom is one. At many parts the shores are overgrown with freshwater mangroves. The forest stretch transfers at it's outer parts into bushes and then into grassland. 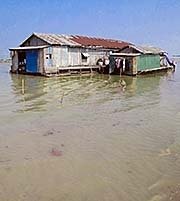 Tonle Sap is one of the richest fishing grounds on earth. However, in the last years the impact of insustainable human economy and exploitation shows traces. Grenade fishing, electro fishing or the usage of poisons harm the fishing grounds and the whole ecology. Nylon nets are spanned across whole streams. 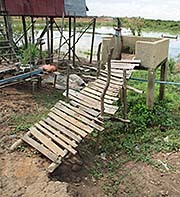 The crocodile farms around consume a great deal of fish as crocodile food. Also snakes and toads are caught in great amounts to feed the crocodiles. The rapidly growing population around the lake increases the pressure on the wildlife. Pollution and overfishing from the people rises. Dam constructions along the lake's shores interfere with the annual flooding scheme. The natural sediment inflow into the lake has been altered in the last years. The flow ist blocked by the first big dams at the Mekong River in Yunnan, China. Also is more and more pollution measurable, comming from the industries mainly in China and Thailand, who are placed along the Mekong banks and drain their wastewaters into the river. The Cambodian government plans to built a number of dams along the tributaries of Tonle Sap and the Mekong River; some of the dams are already under construction. In Laos alone are dozends of dams along the Mekong River and it's tributaries planned, under construction or already completed. The dams are meant to produce hydroelectric power and as a source of irrigation for surrounding acreages (two contradicting purposes, by the way). However, they crucially block the migration routes of a great deal of fish species in the rivers. The news report these days often about plans in Thailand, to take annually 12,000,000,000m3 water out of the Mekong River in Isan to irrigate agricultural acreage there. About 12km south of Siem Reap, following the parallel road to the Siem Reap River, one reaches a small mountain hill with a height of 140m. The mountain served once as a quarry in the French colonial time for buildings in Siem Reap (the French Quarter) and was connected to the town by a railway line. On top of Phnom Krom is another Angkorean temple placed. It's one of three who were built in a line in the reign of king Yasovarman I (889 - 910 CE). As a classial hindu temple it's dedicated to Vishnu, Shiva and Brahma, with it's main access facing to the east. The three main towers house shrines for these central gods and are aligned in north-south direction. 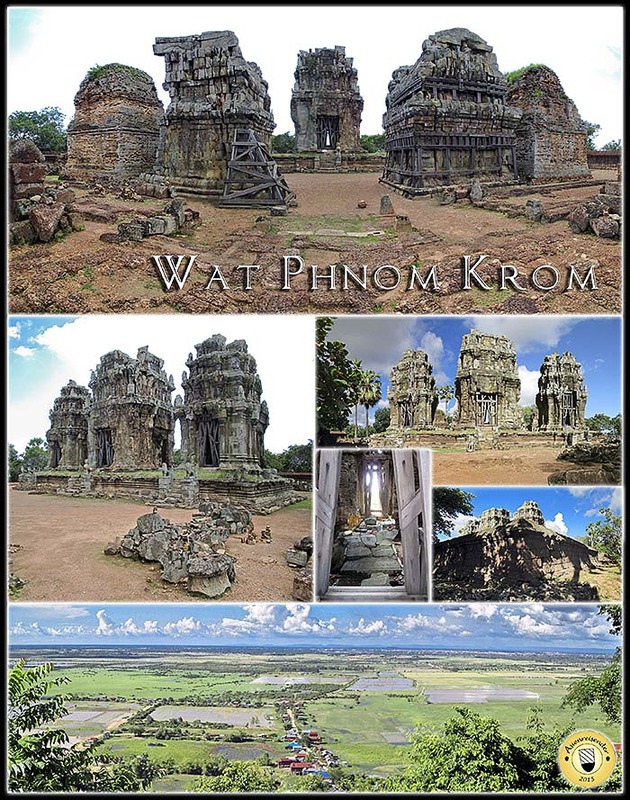 The northern prasat is that for Vishnu, the middle for Shiva and Brahma's is the southern one. In front of the main prasats are four more buildings, who were maybe crematories in the past. The main towers and the two inner crematories are built in sandstone, the both others in brick. The outer wall of the compound consists of laterite. In the central Shiva shrine are some small items and incence sticks placed. On the small rocks nearby people put stones - that is certainly believed to have a spiritual meaning. The views from the mountain top are magnificient. To the south one can see Tonle Sap Lake and the ongoing urbanization at the shores. The other directions overlook flooded plains of acreage. The view to the north grants even a glance on the Kulen Range at the horizon, where the quarries for the Angkorean temples were. All the building material has been transported over more than 60km to here and some 40km to the great temples in and around Angkor Thom and Angkor Wat. It wouldn't be Cambodia if you just could go there. On the asphalt road up to the top wait two officials in a shack and ask for a ticket. There is no ticket booth here, though. It's included into the general ticket for Angkor Archaeological Park.